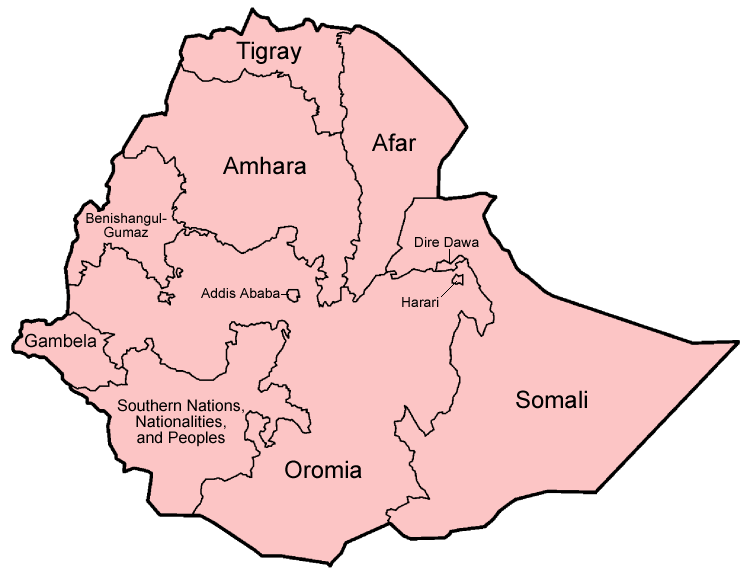 As of 1991, Ethiopia has been the strongest working example of ethnic federalism, dividing the country into multiple regions and assigning land to major ethnic groups. For a country with more than 90 ethnolinguistic groups and a long history of ethnic violence, it was then-new prime minister Meles Zenawi’s way of redistributing power as he overtook from a military regime and preventing further ethnic conflict from tearing the country apart. For better or worse, Zenawi’s ethnic federalism succeeded in preventing nationwide ethnic conflict although tensions have never been fully healed. By essentially separating ethnic groups and giving them their own regions to live in, Ethiopia has been free of widespread civil conflict since the brutal civil war that ended in 1991. It hasn’t always been easy, though. Ethiopia’s ruling coalition has led a suppressive regime until April last year and various rebel groups had to be forced out of the country as terrorists in order to keep the peace. Local conflicts have been everpresent but the government, for the most part, was successful in maintaining security at a national level. However, Ethiopia’s new prime minister Abiy Ahmed is trying to take the country in a new direction. His reforms have stepped away from the authoritarian regime of his predecessors and even welcomed rebel groups back into the country, inviting them to participate in political dialogue. The problem is Abiy’s progressive approach is at odds with the ethnic federalism that has kept Ethiopia together for almost three decades. Now, ethnic clashes are spreading across the country and the country’s recent political structure risk compromising all of the efforts being made to unite the country for a more democratic future. When Abiy Ahmed first stepped into office in April 2018, his biggest challenge was putting a stop to public dissent against the government. Ethiopia was a breaking point but it was a relatively simple case of the country’s two largest ethnic groups (by quite a margin) standing up to the government and its authoritarian rule. It was the people vs state. Abiy belongs to Ethiopia’s largest ethnic group, the Oromos, who were also the most active in violent demonstrations that resulted in two states of emergency and the resignation of former prime minister Hailemariam Desalegn. This was no simple tasks and there was genuine fear that all-out conflict could erupt in Ethiopia. However, Abiy Ahmed – Africa’s youngest leader at 42-years-old – almost instantly brought an end to civil disobedience and replaced it with a policy of radical reforms. In less than a year, Ethiopia’s new PM has brought an end to the long-standing border conflict with Eritrea, driven regional cooperation within the Horn of Africa, welcomed rebel groups back to the country and created a more open political space within the country. The transformation is nothing short of incredible and the PM now enjoys something of a hero status in his homeland and among much of the international community, too. Unfortunately, Abiy Ahmed now faces are far more complex problem that’s also threatening to tear Ethiopia apart – not only into two pieces, but half a dozen or more. Without the government as a common enemy, sections of Ethiopia’s ethnic groups are now turning on each other instead and using their new-found political freedom to attack each other. When Meles Zenawi became prime minister in 1991, following the end of a 17-year-long civil war, Ethiopia was a country torn apart. Some kind of unity had to be established to drive the country forward and Zenawi’s answer was to transform the country from a centralist republic into a federation of nine ethnic regional states and two federally governed city states. Under this system, key rights are given to people based on being ethnically indigenous to a region instead of being Ethiopian citizens. This determines what land, government jobs, representation and other rights people are entitled to. Under previous governments, this ethnic federalism functioned with relative success for almost 30 years. Under strict regimes, people were given little space to express political concerns and the rebel groups that did make a stand were forced out of the country. Separating the country’s ethnic groups reduced internal conflicts enough to prevent national crises – even if tensions remained across many parts of Ethiopia – but it did nothing to heal the root cause of such tensions. Now that the common enemy of a suppressive government has effectively been removed, Ethiopia’s divisions are becoming more apparent than ever. While the added room for political expression Abiy Ahmed has introduced means those groups are liberated to become more active – sometimes with horrifically violent methods. Abiy Ahmed is trying to unite a country that’s divided at its core and removing those lines is going to open up a long history of old wounds. While any political reshuffle that takes power away from those who have it an opens up new opportunities for those who don’t will be problematic – if Ethiopia’s history is anything to go by.